Paul McCartney to Reissue Four Catalog Titles. Beatles Radio: The Beatles, Solos, Covers, Birthdays, News The Fab 4 and More! 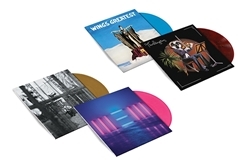 Two of Paul McCartney's most recent records, along with one of his most obscure efforts and a Wings compilation, will be included in his next batch of albums to be reissued. New, Chaos and Creation in the Backyard, Thrillington and Wings Greatest will be re-released on CD and vinyl on May 18. Thrillington is the one that will likely have the most appeal to collectors. In 1971, McCartney produced a lounge-jazz instrumental version of his newly released Ram LP. But he formed Wings shortly after completing the record and decided to shelve it until 1977. He used the pseudonym Percy "Thrills" Thrillington and created a backstory in the liner notes (written by McCartney under the name "Clint Harrigan") about a U.K. socialite who was friends with McCartney. The former Beatle even took out newspaper ads that chronicled Thrills' adventures. It was believed at the time that McCartney was behind Thrillington, but he didn't admit his role until 1989.